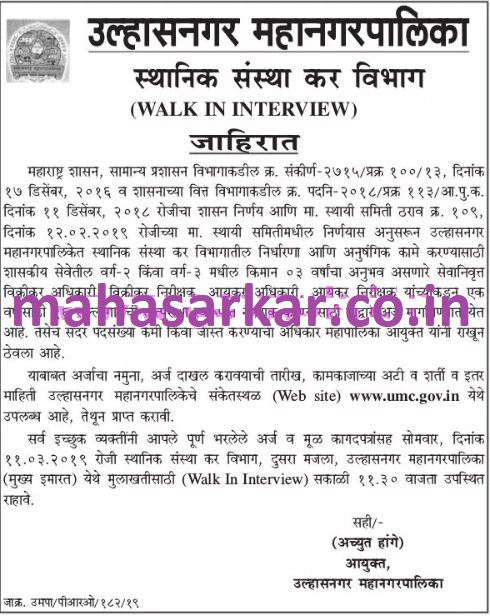 UMC (Ulhasnagar Mahanagarpalika), Ulhasnagar published a new job notification for Consultant Posts. The recruitment is for total 16 Vacancies. The willing candidates are informed to see the latest notification March 2019. Qualification required Retired Sales Tax Officer Sales Tax Inspector Income Tax Officer, Income Tax Inspector With 3 years experience in government service class II and class III posts and More. Walk-in Interview on 11th March 2019. For More details of UMC Recruitment 2019 Read Below. Education Qualification: Retired Sales Tax Officer Sales Tax Inspector Income Tax Officer, Income Tax Inspector with 3 years experience in government service class II and class III posts and More. For Post wise Education Details follow the detailed advertisement. Interested & Eligible candidates may attend for walk in interview along with all the documents addressed at स्थानिक संस्था कर विभाग, दुसरा मजला, उल्हासनगर महानगरपालिका (मुख्य इमारत). Walk-in Interview Date: 11th March 2019.